The United States is withdrawing from the UN Human Rights Council, U.S. Permanent Representative to the United Nations Nikki Haley said in Washington on Tuesday. 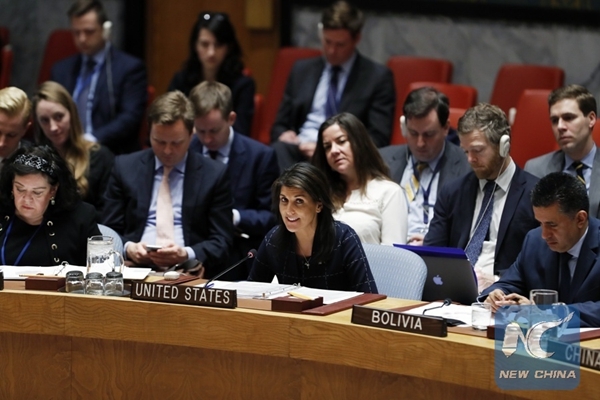 At a joint press conference with U.S. Secretary of State Mike Pompeo, Haley said the council had failed to conduct the "major, dramatic and systematic changes" required by the United States. Haley accused the council of being "a protector of human rights abusers and a cesspool of political bias." "As we said we would do a year ago, if we did not see any progress, the United State is officially withdrawing from the UN Human Rights Council," she said. The United States is withdrawing from the UN Human Rights Council, U.S. Permanent Representative to the United Nations said.